More skeletons tumble out from the cupboard of middleman Christian Michel’s media management. An earlier report by PGurus exposed that AgustaWestland gave around Rs. 45 crores to Christian Michel to manage media during 2010-2012, the controversial purchase period of VVIP Helicopters. The latest email unearthed by agencies shows that Michel’s Dubai firm Global Service had an India Office and the email on April 11, 2008, exposes the fact that Michel was privy to even a forthcoming meeting of high-level body Cabinet Committee on Security’s possible decisions and was involved in the media management. From the above email, two things have become a reality. Only Agusta’s commercial bid was opened and the price hike suggested by Agusta was approved by the Defence Ministry. The email unearthed by agencies shows that Michel’s email from his India office to Agusta’s CEO on detailing about a ‘Times of India’ report and ‘The Hindu’ report dated April 10, 2008. Attaching these two newspaper reports on the possible purchase approval of Rs.15000 crores worth 623 helicopters, cancellation of earlier tender of 197 helicopters, Michel urges the Italian company to increase his budget for media management in India. Michel informs the AgustaWestland CEO about the forthcoming meeting of Cabinet Committee on Security (CCS). This email is dated April 11, 2008, and shockingly, Michel assures Agusta that after only after the CCS decides will Agusta’s commercial bid be opened. The CCS those days comprised of Prime Minister Manmohan Singh, Defence Minister A K Antony, Finance Minister P Chidambaram, Home Minister Shivraj Patil, and External Affairs Minister Pranab Mukherjee. And we have already seen the Italian Court documents showing Michel’s claims of his association with Sonia Gandhi and her Political Secretary Ahmed Patel, who virtually controlled the UPA regime. “If we are totally successful in 6 to 8 weeks the CCS will pass down an order to open your commercial bid alone. If this happens, then we enter the commercial discussions. This too will be a very tough negotiation as the budget set is totally inadequate. We are looking to see if we can raise this budget in this new financial year. The media initiative as discussed with P. H. is now fully engaged and working well,” said Michel in the email to Agusta CEO. Who is this P. H.? 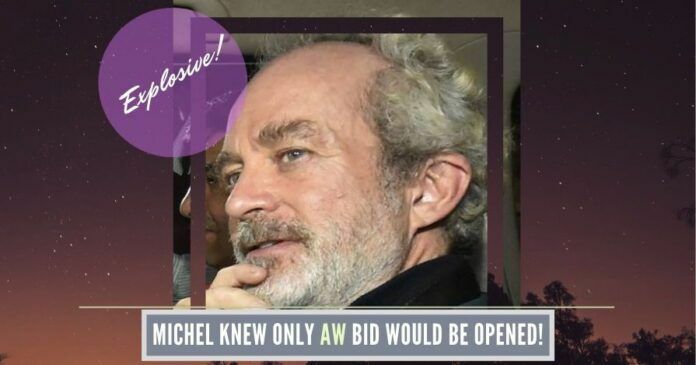 We don’t know what Michel revealed to the investigators. PGurus had earlier reported that Christian Michel had handled Rs.45 crores in 2010-2012 to handle media management in India and our report exposed how Indian media was pliable during the scam period when Rs.45 crores was thrown by Michel’s Global Services for Agusta. Now this new email that has stumbled out shows that Michel’s was handling Indian media from 2008 and he was well aware of what was going to happen in the Cabinet Committee on Security (CCS). Previous articleDelhi Assembly’s massive recruitment of Fellows for Rs.1 lakh/ month to assist MLAs & Govt. Public funding used for AAP cadre?